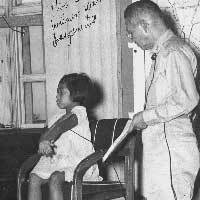 Reviewing Authority's Recommendations: Accused not only administered beatings and mistreatment of PWs in open view for no apparent reason or for violations of camp rules (stealing tea, smoking) or for not working hard enough but also viewed many such beatings and mistreatment at the hands of his subordinates. Accused and his subordinates regularly beat PWs; many times, after work, the civilian guards beat and mistreated those they felt did not work hard enough that day. Not only were individuals guilty of violations subjected to beatings and mistreatment but the rest of the PWs were also beat while punishment was being administered. The accused, refused to take action on the murder of a PW by a civilian guard; in fact, in response he stated "that nothing would be done and that if we did not behave ourselves the same would happen to us." The following day, some of those who requested action to be taken were beat. At a later point, another PW was murdered by another subordinate of the accused. Men unfit for work were ordered to work and sometimes had to be carried to the work site on a cart; there was insufficient food and clothing. The food, clothing and other supplies made available by the Red Cross were withheld from the prisoners and were used by the defendant, his subordinates and all of their families. Furthermore, medical treatment was withheld and denied to PWs; the accused should have known of PWs' serious condition as the prisoners were weighed once a month and because accused visited sick PWs. Whenever there was air raids, guards would be posted at the doors of the barracks or have machine guns/tanks pointed at the barracks so that prisoners had to stay in the barracks. From the point that the accused took over as camp commandant and especially after the air raids began, the daily beatings increased in intensity and number. Reviewing Authority: Admitted to slapping two PWs on two separate occasions; denied the scope of the incident as presented. Denied harming PWs on any other occasion; testimony of Japanese and PWs introduced stating that accused was never seen harming PWs. Testimony of other PWs offering different views/opinions/facts/perpetrators were introduced. The findings of responsibility in cases of other war criminals were introduced. Denied hearing about the occurrence of many incidents and denied that a complaint was brought to him by either the PWs or Japanese. Denied that he did nothing to stop or prohibit beatings; guards were told that accused was only one who could give punishment and PW testimonies introduced showing that beatings stopped when accused entered the area. Denied having power in terms of location of the camp, location of the bomb shelters including the poor construction of shelters which afforded no more protection than the barracks, food, clothing and medical care, including sending sick PWs to work. Japanese Army regulations were invoked as reason for some subordinates' actions; evidence introduced that proper steps were taken after receiving reports of these particular incidents. Discrepancy in dates of the charges pointed out. Prosecution Arguments: No ruling of the commission adversely affected the rights of the accused. The record is legally sufficient to support the findings of the Commission. In response to the defense motions for modification of findings based on the customs of the Japanese army, issue of "contributing to death," and question of evidence, reviewing authority stated that the Commission ruled correctly. In regards to the issue of command responsibility and the defense contention that these acts were "isolated cases of abuse of the PW by his subordinates, and therefore the camp commander cannot be held responsible," the many allegations conclusively proved by the evidence "belittles" this defense. The instances where the accused admits of mistreatments by his subordinates and his punishment of them "should have put the accused on notice that mistreatments were occurring." To the contrary, he "set a pattern for his subordinates to follow" by participating himself in the mistreatments. The frequency would have made it "impossible to keep them secret from the commander" and at the same time would be "extremely negligent for a camp commander not to know that these incidents were happening." As to the defense contentions that findings be modified or changed, the severity of the beatings, the narrow scope of the affidavits, the leeway given to commissions when taking judicial notice of other cases, and the inconsistencies naturally expected between different witnesses to same events were noted as belittling various defenses presented. The reviewer stated that the compelling evidence and the findings warrant a more severe sentence. Judge Advocate's Recommendations: Merely stated concurrence except for the necessity of the prosecution to announce its authority for requeste Nolle prosequi of a specification (spec 17) that the reviewer stated necessitated a finding of not guilty.